Well I’m back from a lovely break but I think I’m not going to post daily any more. It was a great experiment and I was glad that I managed to do it for more than a year but it is a lot of work and takes time away from sewing. I hope you’ll hang in with me as I will post when I have things to share and hopefully that will be often. I’ll miss your daily blog, but I can’t imagine the amount of work. I know I’ll thoroughly enjoy it whenever you send it. 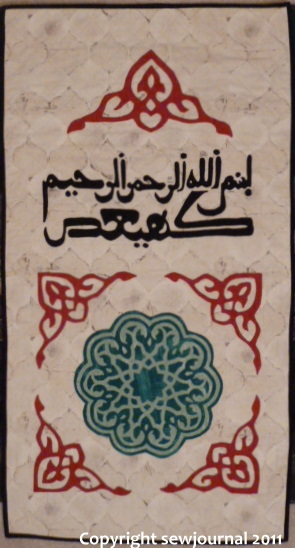 The wall hanging is really beautiful, the background fabric is perfect and looks like old fired tiles on mosque walls. I will miss your daily posts as well but will enjoy whenever you write… Your wall hanging is magnificent! beautiful! 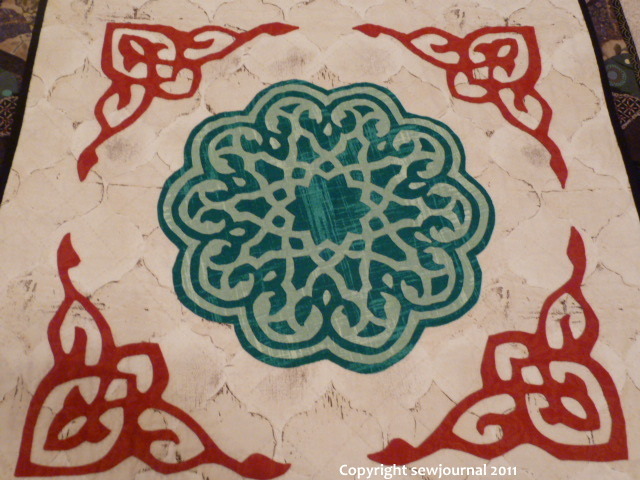 and like the previous comment reminds me of tiles here in Turkey (Iznik tiles especially) in the old mosques and palaces… Wonderful work! Heard a few tiny bits and pieces re: your holiday from some in the quilt group – would love to hear more 🙂 Again, the wallhanging is something to be really proud of. As one of those people who got to share time with you on your trip here to the states, I can only say, you, your blog, and our friendship is even more precious to me. Ladies, wait till you see Munaiba’s photos! I will also miss the daily posts, but will cherish the ones you send even more! Your wall hanging is exquisite. You must be the world’s most patient stitcher….8-). Is it difficult to learn to read Arabic? It’s sooo different from English lettering. One of these days, if you come to the states and are on the (south) west coast, I would love to meet you in person. I’m looking forward to the pictures. I’m amazed you could keep daily posts up for so long – it really is a huge investment of time and energy. It’s not like writing an email. Love the wall hanging and have been enjoying your travel posts . Sounds like you had a great time!